When Andrew went up to Washington DC last week he accidentally left his coat at home. It's an easy enough mistake to make on a November afternoon in North Carolina. It was quite warm when he left. But by the time he reached DC it was nighttime and it was cold. He went into a store close to the bus stop and found a jacket that was 50% off and bought it. "Are you sure that's a men's jacket?" I asked when I saw it. It just looked like a women's jacket to me, that's all. But he said he found it in the men's section and that when he went to pay for it the cashier asked him if he wanted it in a bag or—probably noticing his lack of other outerwear—if he wanted to wear it out of the store. "I'll wear it out!" he told the cashier emphatically. "And she didn't even say, 'Is this for your wife?' or anything," he told me, equally emphatically after recounting his purchasing experience. "It just kind of looks like a women's jacket," I repeated. "It's not!" he said. "It was most definitely in the men's section." So I looked it up. I typed "hexagon quilted jacket men's" into my browser and one of the first hits was a picture of the very jacket Andrew was wearing. And it was in the men's catalogue. "Oh, yup. Here it is," I said. 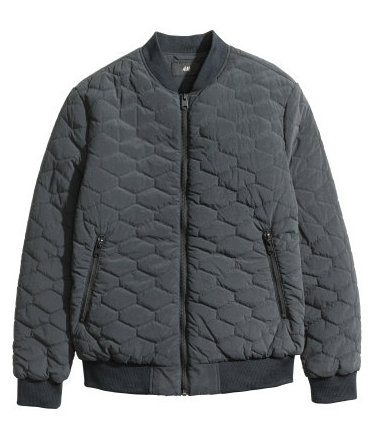 "It's a 'quilted bomber jacket.'" "Right!" Andrew said. "Designed for bombers in WWII. And we all know bombers were men. So...it's a very masculine jacket." Fine. It's a men's jacket. Whatever. Benjamin outgrew the winter coat he's been wearing the past few years. It's size 2T. He's four and a half. It was probably about time to outgrow that coat. But we don't have another coat for him...yet...and I don't want to go out an buy him a coat until after Trading Tables (because you never know what gems are going to show up there). I was hoping it would just keep being warm until Trading Tables (which is next weekend), but it's been a little chilly the past couple of days (it's only 44°F right now (6°C)) so he's needed something to keep him from freezing outside, so I busted out Miriam (and Rachel's) old jacket (that we scored at a Trading Tables event way back in 2012). It's turquoise, and looks just a little bit like a girl's coat (because, frankly, it is a girl's coat). But don't tell him that because he believes 100% that he's sporting a "quilted bomber jacket," just like Daddy! Even when he went outside and the girls across the street said, "Isn't that Miriam's? That's a girl's coat!" he proudly responded, "It is not! It's my new quilted bomber jacket!" Warm is warm is warm is warm. That's what's really important. He can't help it that he's surrounded by females. Speaking of weather, I was talking to my sister last night (for "ten minutes" turned over an hour) and I told her about how Rachel went camping with her friend this weekend and her friend's mom called to say that they might be setting up the tents inside the church because it's supposed to "drop into the fifties!" I solemnly nodded my head and was like, "Oh, yeah." I didn't know what else to say and when I hung up the phone I chuckled to myself. Rachel wanted to know what was so funny so I pulled up some climate charts for Durham and Kananaskis and explained to her that temperatures "dropping into the fifties" in the middle of the night in November wasn't really concerning for me because I grew up camping in Kananaskis where the daily highs were in the fifties in the summer. "Did you tell her about the time you took a helicopter to the peak of Mt. Assiniboine in the middle of a blizzard in June?" Abra asked. "And then we were hiking through, like, eight feet of snow? Ha! No, I didn't tell her that," I said. "It's actually been pretty warm here lately," Abra mentioned. "We got that one skiff of snow, but other than that we haven't had any. And it's only been, like, -4°C!" Usually our lows here in Durham are about on par with the highs Abra experiences up in High River. We've only just started dipping below freezing in the middle of the night. We went to the park a week or so ago (before we'd had any frost at all) and noticed a volunteer tomato plant growing by the pool fence, absolutely laden with fruit. I remember seeing it struggle to survive the heat of the summer and wondering how it would fare. When we saw those golden-green globes dangling tantalizingly from their vine, I suggested we pick them and take them home. "But isn't that like...stealing?" the kids wanted to know. "More like...gleaning," I said. "This isn't anyone's garden. The plant doesn't belong to anyone. It's a weed growing by the pool fence. We're picking it. Like, if there was a dandelion growing here you wouldn't hesitate to pick it and bring it home. This is the same thing." "But it's food," the kids pointed out. "But if we don't pick them no one else will. Squirrels or deer will come and take the tomatoes and, honestly, since they got all our tomatoes except, like, two, I have no problem taking these tomatoes from them. Now, if this was a tomato plant in a garden in someone's yard that they'd been tending all summer and fall, then this would be stealing. But it's not." So now we have a dozen garden poolside tomatoes ripening on our counter. I totally like Ben's blue bomber jacket! A coat is a coat. Girl coats and boy coats...who cares? I wonder if is the quilted that throws you. When I hear quilted I think old ladies wearing track suits in the mall :) I feel like my grandma must have had a quilted jump suit or something for me to think that, but the color and the cut look masculine so that's good. WTHeck girls across the street. Shesh! 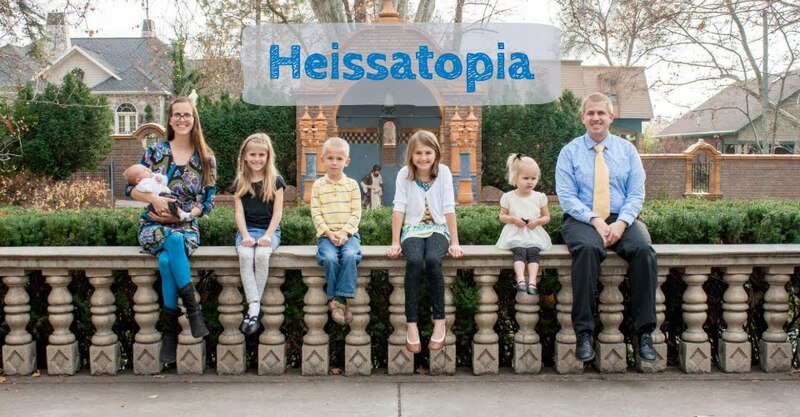 I think the kids look adorable. "and her friend's mom called to say that they might be setting up the tents inside the church because it's supposed to "drop into the fifties!" I solemnly nodded my head and was like, "Oh, yeah."" -- so funny!